July 25, 2018 – Stone Ridge, NY – SUNY Ulster Fine Arts Program Coordinator and Professor Iain Machell has artwork on display at multiple exhibitions throughout the summer. These include pieces in “What’s Next?” at Unison Arts Center, a Saugerties Artists Tour with several exhibit locations, and a drawing on display in “The River Flows Both Ways” at the Hastings Village Hall Gallery. 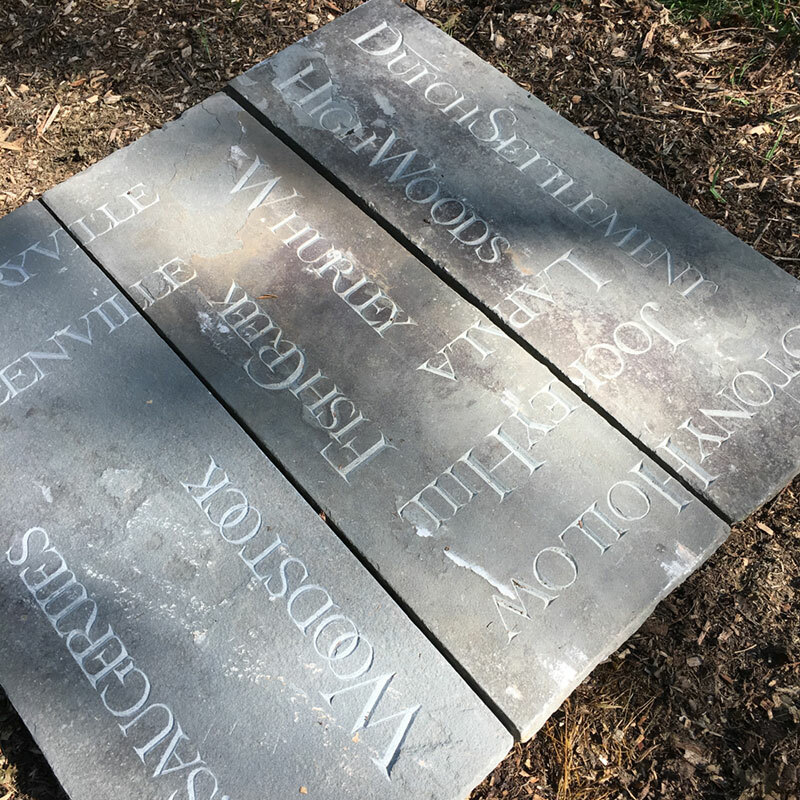 Machell’s stone sculpture, “Quarries,” is currently on display at the Unison Arts Center for the “What’s Next?” outdoor sculpture garden. “What’s Next?” features sculptural installations and events by thirty-five artists residing in the Northeast who represent an emerging art movement known as Eco Materialism. For more information on the showing, visit https://www.unisonarts.org/event/sculpture-garden-opening/. Machell will have several art showings in Saugerties over the next month, including an open studio in the Saugerties Artists Studio Tour. His studio in Malden-on-Hudson will be open to the public on August 11th and 12th from 10:00 a.m. to 6:00 p.m. There will be an exhibition of tour artists at Kiersted House Barn in Saugerties on July 28th and 29th from 11:00 a.m. to 5:00 p.m., as well as one at Opus 40 in Saugerties from August 11th to September 10th, with an opening reception on August 10th at 5:00 p.m. For more information about the Saugerties Artists Tour, visit http://saugertiesarttour.org. Machell has a drawing included in “The River Flows Both Ways” at the Hastings Village Hall Gallery, sponsored by the Hastings Village Arts Commission and Newington-Cropsey Foundation in Hastings-on-Hudson from September 1st to November 3rd, with an opening reception on September 6th from 6:00 p.m. - 8:00 p.m. For more information, visit https://www.facebook.com/hastingsartscommission/. Iain Machell teaches studio art and currently holds the position of Professor & Fine Arts Program Coordinator at SUNY Ulster. He was awarded the SUNY Chancellor’s Award for Excellence in Teaching in 2012. He has been a Visiting Artist and Lecturer to a variety of colleges and universities including Parsons School of Art, University of Massachusetts, University of Wisconsin-Madison, and Ball State University. For more information on the SUNY Ulster Arts Department, visit http://arts.sunyulster.edu/fine_art. For more on Iain Machell, visit his portfolio website at www.iainmachell.com.